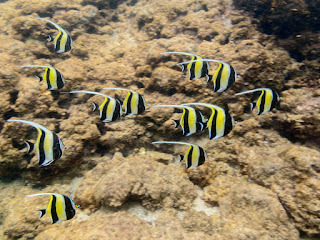 After weeks of being (nearly) shut out by large waves and poor visibility, the Maui Pink Cap Swimmers were back in force this morning. 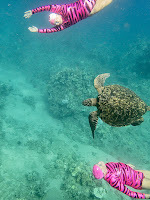 Christine & Doug were sporting rather subdued pink rashguards and suits which are meant to scare away big predators - and they worked. Click HERE for several more photos from today's ocean swim.